Chekhov, unbeknownst to many, is one funny writer. In fact, in the hands of Pallas Theatre Collective, Chekhov is a veritable vaudevillian; in The Tragical Mirth of Marriage & Love they grab the master playwright by the lapels and for 75 minutes flail him about the stage in one extended slapstick bit after another, to much uproarious laughter from the audience. Whew! It’s quite a workout on a hot summer day. The production takes several of Chekhov’s short plays on the themes of marriage and love and blends them into a fluid montage. In fact, the circumstances are so similar in several that one could easily assume that the characters transmit from one play to the next, but they are, in truth, separate plays. In The Bear, a widow with a large estate (Allison S. Galen) is visited by a neighboring landlord (Michael Boynton) to whom her late husband owed money. What ensues is a knock-down, drag-out battle of wills, until the debtee suddenly realizes he is smitten with his debtor, and his smoldering attraction derails him. In The Proposal, Galen and Boynton again play the wooed and the wooer in this comedy-of-errors about two stubborn, hot-tempered rural Russians. Boyton’s aging bachelor comes to court Galen’s unmarried daughter of a landowner, and what follows is a full feuding gallop across the stage, a fever-pitched Kate-and-Petruchio battle played out–not over the subordination of women–but over the small, Hatfield-and-McCoys stuff that fells many a marriage: whose dog is more dogly, whose family owns the meadow, all fueled by their newly-discovered and now wildly percolating sexual attraction. Fast forward a few years, and one can well imagine a Chekhovian “War of the Roses” played out in a Russian farmhouse. Not a pretty picture. …grabbed the audience by the lapels and shook folks into having a good laugh. Later, in The Wedding, Galen and Boynton again play bride and groom, this time dancing blissfully through their wedding celebration while the comic manipulations of their families unfold around them, and we are relieved to see these two actors in quiet, sweet inlovedness. Amid the full body tumult of much of the production, several subtler, more nuanced performances stood out, respite from the matrimonial storm if you will. Steve Beall as the drunk father of the bride, Joseph Michael Jones as the wedding planner, K. Clare Johnson as the mother of the bride and an old lady, Elizabeth Darby as a Greek national, and Julia Morrisey as the object of another’s affection. There is a lovely bit of theatrical precision in The Anniversary, in which three bank employees clatter away on their imaginary typewriters in the background, a nice touch in this minimalist Fringe production. Directed by Ty Hallmark, and aided by simple period costumes by Olivia Brann, sound design by Ty Hallmark, and lighting by Scott Kincaid, Pallas Theatre Collective—which also included the versatile David Dubov and Luke Cieslewicz—has thrown itself full force into this ensemble production. They are clearly having such a rollicking good time that—at least for a time—they also grabbed the audience by the lapels and shook folks into having a good laugh. 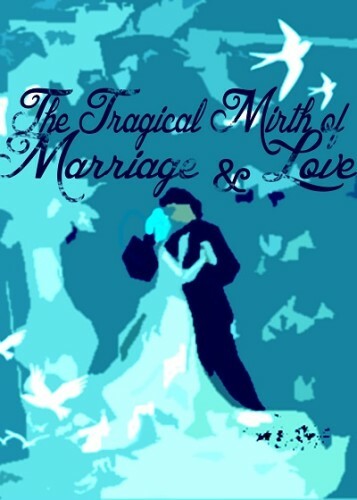 The Tragical Mirth of Marriage & Love plays at Location #1: Fort Fringe – The Shop, 607 New York Ave NW Washington, DC 20001. For tickets click here. Elizabeth Bruce, co-founder of Sanctuary Theatre, is an educator, theatre artist, and novelist who has worked with children and artists for over 30 years. She has long led the Multidisciplinary Arts Program at CentroNía, and now serves as Community Arts Producer. She has received grants from the DC Commission on the Arts & Humanities and Poets & Writers, Inc., and founded the Women Artists/Women Healing series. Her debut novel, And Silent Left the Place—published by Washington Writers’ Publishing House—received distinctions from the Texas Institute of Letters, ForeWord Magazine, Small Press Distributors, and The Montserrat Review. She has studied with novelists Richard Bausch, John McNally, Lee K. Abbott and Janet Peery; her publishing credits include Paycock Press’ Gravity Dancers, Washington Post, Lines + Stars and others. 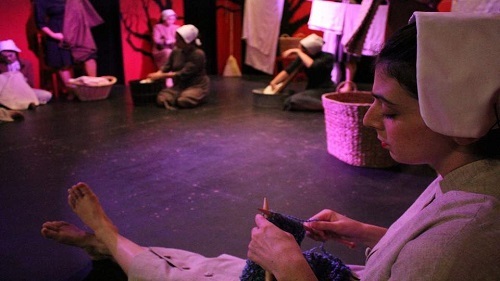 A member of Playwrights Forum, her scripts have been staged at Adventure Theatre, Washington Ethical Society, Howard University and Sanctuary Theatre, as well as Carpetbag Theatre as the Lucas Award winner. She performed most recently with Solas Nua and Sanctuary at Capital Fringe Festivals, and holds a BA in English from Colorado College.